Dry weather may be on the cards later this year, but an Indonesian official has promised that there will be no haze blowing in from South Sumatra . Governor Alex Noerdin said yesterday that the province - responsible for most of the fires that caused the haze two years ago - has taken steps to address the issue. Canals have been blocked to dampen drained peatlands that can otherwise catch fire. Farmers have also been educated on ways to clear land without turning to slash- and-burn methods, he said. 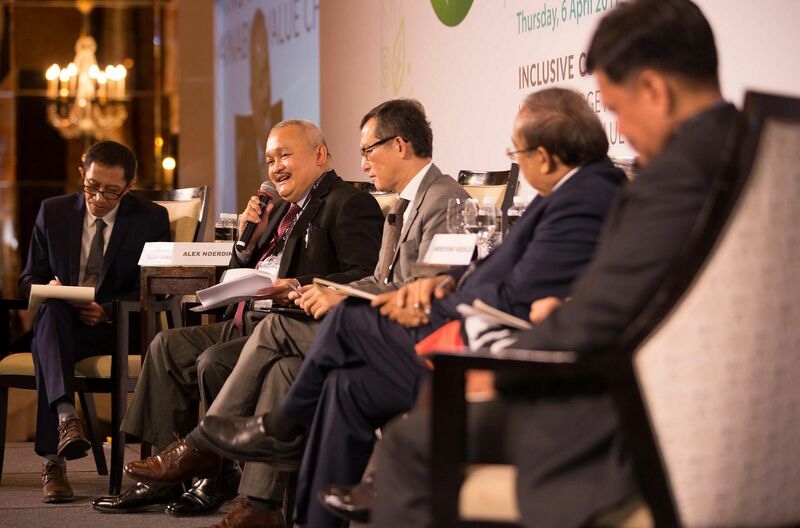 "This year, we are strengthening our efforts... No fire means no haze from South Sumatra province this year, and next year, and the year after," Mr Alex told the media on the sidelines of a conference on haze organised by the Singapore Institute for International Affairs. During the event, Environment and Water Resources Minister Masagos Zulkifli commended Indonesia for its efforts in dealing with the perennial problem. "Indonesia has taken positive actions to contain the number of hot spots over the past year," he said, adding that there were just over 100 hot spots in Indonesia last year, down from thousands in 2015. The Indonesian government also acted quickly to contain land and forest fires in Riau in January by declaring a state of emergency there, he said. Mr Masagos also pointed to longer-term measures put in place by Indonesia to address forest and land fires at source, such as the five-year moratorium on new licences to establish oil palm concessions announced last year. "(This) will halt the draining and clearing of new carbon-rich peatland," said Mr Masagos. Peatlands catch fire easily when they are drained in developing plantations. During the same conference last year, another Indonesian official made a similar promise. Peatland Restoration Agency head Nazir Foead said there was "zero chance" that haze as bad as in 2015 would blanket the region. His prediction came to pass - Singapore experienced one day of haze last year, compared to the two months of bad air in 2015. But this was partly due to more favourable weather conditions. The region experienced more rain last year compared to 2015, an El Nino year, when hotter and drier weather caused the fires to burn for longer. Associate Professor Koh Tieh Yong, a weather researcher from the Singapore University of Social Sciences, said models have predicted a 60 per cent chance of a moderate El Nino occurring by the end of this year. Anti-haze group PM.Haze (People's Movement to Stop Haze) is adopting a wait-and-see attitude. "Even though canal blocking efforts to re-wet drained peatlands are ongoing, the water levels may not be high enough to prevent them from catching fire, especially during the dry season," said its executive director Zhang Wen. Meanwhile, Malaysia said it is mulling over whether to enact a law similar to Singapore's Transboundary Haze Pollution Act, which aims to punish those responsible for causing or condoning fires if they result in unhealthy levels of haze here. Its Natural Resources and Environment Minister Wan Junaidi Tuanku Jaafar said: "We were considering it, but looking at Singapore's experience, implementation of the law is not simple... as you need the (culprit) to be physically present in Singapore to take action."